Demand response program (DRP) and energy storage systems (ESSs) are two main tools for load management in smart grids. They can make distribution networks more reliable without costly upgrades for substation constructing or lines reinforcement. 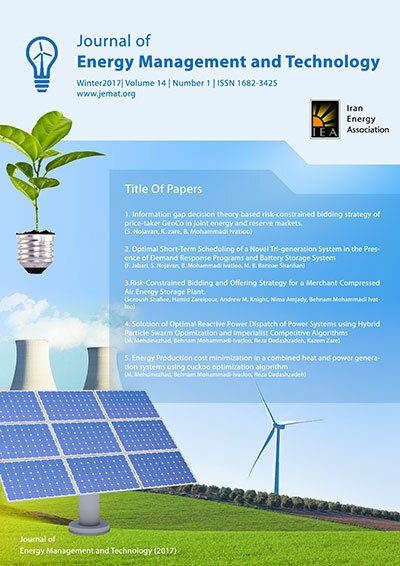 This work proposes an optimization framework of optimal sitting and sizing of ESSs in a smart distribution network in the presence of DRP and considering renewable energy sources (RESs) effects and network constraints. The proposed objective function includes two terms: 1) minimization of total investment costs of ESSs; 2) minimization of active losses cost and the power purchased from upstream grid and diesel generators. DRP can reduce operation costs by shifting an amount of loads from hours with high demand to hours with lower demand and so can reduce network losses and help in peak load shaving process. In order to solve the proposed optimization model, a mixed-integer non-linear programming (MINLP) model is constructed and solved using DICOPT solver by GAMS optimization software. A modified 33-bus distribution network is considered and the results of three different cases are compared. Finally it can be noted that total cost of network in case 2, with optimal ESS allocation is reduced by 4.9% with compare to the base case, while this reduction is about 20% in case 3 with considering DRPs beside ESS allocation.